Creativity expert Sir Ken Robinson challenges the way we’re educating our children. He believes we should cultivate creativity and acknowledge multiple types of intelligence. In today’s schools, he asks, in a Ted presentation, who gets all the brownie points, where are the winners. On many islands Vanuatu schools temporarily don’t exist anymore. They were blown away. Houses are gone, water tanks destroyed, stored crops scattered. The people need salt, soap, cement to repair rain storage tanks, water purification tablets, electricity. Matches. Corrugated iron. water, water, water. Fishing boats need repairs, roads need reconstruction, and schools, schools, schools. Years ago, even such a cyclone would not have been so materially disastrous. The people expected these storms almost yearly. 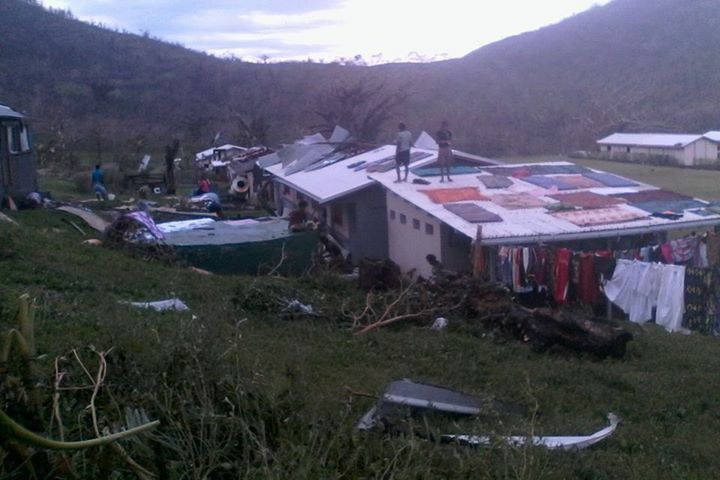 They knew the signs, they knew to hide in caves, they knew how to build houses in safer areas with roofs low to the ground, how to prepare and store breadfruit for storage underground, where to put the chickens, how to secure the pigs. It was a non-money society, no mortgage, no school fees, few stores. Cyclone Pam struck at the heart of things – their newly acquired connections to material things. Cell phone and internet links were down. Now that these media are back in operation, things can quickly go back to normal, because life in Vanuatu now depends on money. Even the poorest Ni-Vanuatu will be needing money for school fees. Others need it for work, or to pay for internet and cellphone plans. Digicel Vanuatu predicts that by 2017, 98% of Ni-Vanuatu people will have access to cellphones. There will be no place in the South Pacific, a last stronghold, where peace, where silence, can reign. And in recent developments, the government headed by PM Kilman will “not hesitate to support responsible legislations to control the media”. We can add this problem to rising crime rates (many arrests for crimes to do with marijuana!! !, hard to imagine in a land where cheap kava, much more hallucinatory, is widely available), unstable politics, corruption at all levels, and an economic dependence on tourism. The cyclone has put paid temporarily to the Amelbati Cannibal Site Tour, The Vanuatu Jungle Zipline, the Kuskus bat tour, the Louniel Beach and Waterfall tour among others. On the other hand, the country retains its uniqueness. Where else would the courts still be ruling on witchcraft cases, putting the guilty in jail for 15 years. Where else would a man dig up his yam, safe from the hurricane as it had been ‘gestating’ underground for nine months, discovering the metre-long root to have human features, and two arms. So who has won since we interlopers took over. We, the countries who invest and intrude, seem to have all the brownie points and the Ni-Vanuatu don’t seem to be winners. Yet. I have faith in this smiling island people. Underneath the trappings, underneath trying to join the modern world, there is a great respect for common sense ways, and for the traditional ways. Okay, I’ll take off the rosy-lensed glasses; the world is advancing on Vanuatu, and it’s too late to save some of the good things.